Russell Secker: I've achieved New Balance! 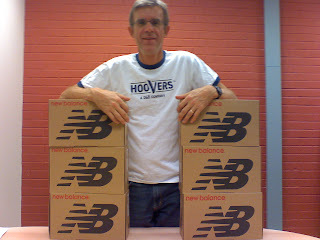 Christmas came early for me this year, thanks to the good folks at New Balance. Six shiny new pairs of 757s arrived at my Hoover's office today; they should hopefully get a grateful me & my aching feet across Europe. Four months to go, and feeling strong. My plane ticket to the start line in Bari, Italy is purchased, as well as an optimistic return ticket from the airport closest to the finish - Alta, in northernmost Norway - 10 weeks later. Just the small matter of Austria, Germany, Sweden & Finland in between!